I’m an avid runner. And while I’ve run with an Android phone and various apps for quite some time, I’ve been increasingly wanting an Android Wear device that would make my many Garmin wearing running mates covetous. Enter the Moto 360 Sport, one of the first true Android GPS-enabled running smart watches. Considering how much I liked the Moto 360 Gen 2, I was eagerly awaiting the 360 Sport, which was announced at the same time as the Gen 2 but had a later release date. The 45mm device comes with the same size 1.37″ display (including flat tire) as the Gen 2, but the AnyLight Hybrid display makes it easily readable even in sunny conditions. The silicone strap comes in Black, White, and Flame Orange but as it’s part of a unibody construction it is not changeable. While many reviewers have found the strap to be a lint magnet, after over a month of use I did not find that to be an issue. The device has an optical heart rate monitor, barometric altimeter, accelerometer, ambient light sensor, gyroscope and a 300mAh battery. Like the Gen 2, it is IP67 dust and water resistant. Moving on to using the device, I found the construction to be solid and the watch comfortable to wear even during long runs. Most popular running apps have Android Wear support at this point, although I’ve found most (I regularly use both Strava and Endomondo and extensively tested Runtastic, Runkeeper, Map My Run, and Ghostracer) have at least one annoying issue that needs to be addressed before being a true competitor to dedicated running watches. The platform also seems to be a bit temperamental, which resulted in me missing out on data points for a couple interesting runs. For example, the data for my Boilermaker run (a 15k) shows over an hour of activity but a distance traveled of zero. That particular issue seems to related to a known bug with Endomondo and Wear devices that have GPS. On the note of the GPS, I found it to be roughly as accurate as my phone GPS, although getting a lock takes substantially longer. It’s less useful than I hoped though, as using the GPS and active display means the battery life isn’t sufficient for longer runs. The device has 4GB of internal memory which you can play music from, although I did not test this feature. I found the heart rate monitor to be accurate enough to be useful and a nice addition to my running metrics. So, what’s the verdict? Although the Moto 360 Sport lacks more advanced features such as cadence and VO2 max, it’s a very capable device. For shorter runs it will allow you to leave the smartphone at home, and for long runs being able to see stats during your run while being able to move your phone from an armband to a pouch makes for a more enjoyable experience. The display really is top notch. With the original MSRP of $299 already marked down to $199 it’s a device I would have tacitly recommended now and as the platform matures I could have seen that turn into a much stronger recommendation. I was definitely looking forward to the second iteration of the device. Unfortunately after 47 days of use, the device rebooted while I was running then shut off. Once I got home and put it on the charger it went into a boot loop. I did some research online and found out some other people had a similar issue. While most weren’t able to fix their device, I found one suggestion that involved completely draining the battery then charging it overnight. This worked a single time, but during the next run the device shut off and further research and troubleshooting were not able to resuscitate it. I was a little bummed, but these things happen with electronic devices and I went to the Motorola support site to start the RMA process. This is where the experience gets unfortunate and things did not start out well. I tried multiple times to begin the process online, but received the following error: “100-02. Oops!! !” After that error persisted for a few days, I finally called support. Unfortunately support was not able to verify the serial number on my device, despite multiple attempts which included me sending them a photo of the sticker affixed to the box which contains both the SKU and serial number. After some back and forth I ask for an RMA despite the serial number issue, as the device comes with a year warranty and has not been out for even close to a year yet. I understand they have legitimate reasons for needing the serial number, but they can get that off the device once they have it. In this context, it’s not needed to validate warranty coverage. The rep said they could not proceed without a “scanned copy of the receipt”, despite me pointing out that 100% of Moto 360 Sports have to be in warranty. I also explained that as this is 2016 I purchased the device online and do not have a receipt to scan. After some additional back and forth, on August 2nd I send them a screenshot of the online order, while also pointing out this is a pretty silly thing to have to do. At this point I just want to get the process moving. At this point I reach out to @Moto_support, but am told: “Please follow up with us via email”. I also now note that I am using this device to write a review for a site that gets quite a bit of traffic, hoping that will help expedite things. It does not. On August 10th, I get an additional update: “I am contacting you to provide you updates about the VHD ticket submitted, it is still being worked by the team in charge.” It’s now been over a week since I initially opened a ticket with the support rep.
On August 11th the VHD issue is solved. They want me to ship them the device so they can evaluate it and then either repair or replace it, or give them $25 for the “Advanced Exchange program”. I explain that after over a week of waiting, the fee on the AE program should be waived and a device should be sent ASAP. They eventually agree. Via the email ticket I give them all contact information as requested. Shortly after I get a voice mail from Motorola with no callback number and no email contact info that ends with “just email us back, okay”. I guess this means reply to the ticket, which I do. On the 12th, I get a call from Motorola. They now say the fee cannot be waived because the system will not let this happen, but it can be refunded after the fact. I point out that this directly contradicts what was previous said by them. They persist. I eventually capitulate and give them my credit card information. The experience at this point is getting really frustrating and taking up far too much time (believe it or not, this is just an overview of the event which included quite a few calls and back-and-forth emails over trivial issue and re-re-re-confirming information). I get an RMA email while I am still on the phone with the rep, which is encouraging. I just want to run and I now think a new device is on the way. I am sorely mistaken. A short time later I get an email saying the credit card is “invalid”. We confirmed the number on the phone three times; it is not invalid. During the next call I note that it’s odd that the card would be invalid as I received an RMA. I am told: “even though you received shipping labels or tracking numbers, the system sends the emails automatically, that is why you received them, but in the system they did not go through”. This makes no sense, but I give my credit card details again. I get another RMA while on the phone, but notice that it’s for the incorrect device (a Moto 360 Gen 2, not a Moto 360 Sport). Looking back, the first RMA was also for the incorrect device. It is explained to me that this is normal and not an issue. A couple hours later I am told that my credit card was now declined. I have used this exact card before and after the RMA and the card is nowhere near its limit. I call the credit card company. There have been zero attempts from Motorola and zero declined transactions for the day. I am now starting to lose my patience. On the next call I explain that the number is correct and the card has not been declined. They suggest I try to submit the request online again. I get the same “100-02. Oops!! !” error. I point out how ridiculous this is getting. The rep now suggests that I use a different serial number than the one that is on the box. This does not seem normal. Using the new serial number does get me past the previous error, however, and may explain the incorrect device issue. I now get a credit card error. I point out that it’s odd that the system never asks for a CVV, but they don’t seem to know what I am referring to. I try the online system again with a new card. One that has a zero balance and that I rarely use. This time I am met with success. They double check the system and everything looks good. Hooray! They now ask for a “bank statement”. I tell them in no uncertain terms that they are not getting one and am now starting to lose my temper. They ask me to submit the request again from scratch. I point out how absurd this entire interaction has been and also note that the Fed Ex tracking number they gave shows that something has actually shipped. Between that and the pending charges, I think their system is incorrect and the third RMA has been processed. They do not agree. They also do not have an explanation for the multiple charges for different amounts, neither of which they see on their end. 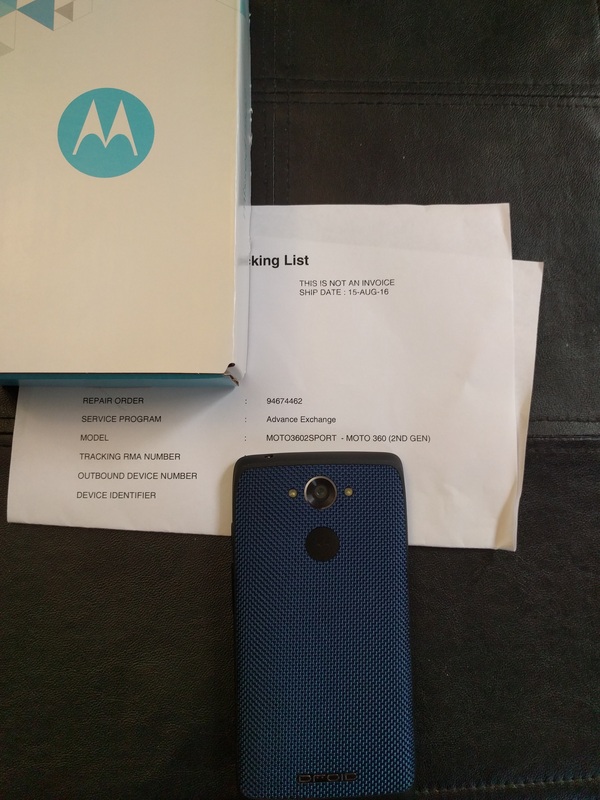 I received the following response on August 17th: “That is correct all RMA’s have failed, and nothing has been shipped despite the tracking numbers you received.” I also received a package from Motorola. Containing a Motorola DROID phone. A PHONE! I can’t even begin to fathom how that’s even possible, considering the packing list actually says “MOTO3602SPORT – MOTO 360 (2ND GEN)” on it. I called my credit card company again, and at no time were any transactions declined. They do see both pending transactions from “MOTOROLA MOBILITY LLC” but “they are set to fall off your account because they were never finalized by the merchant”. 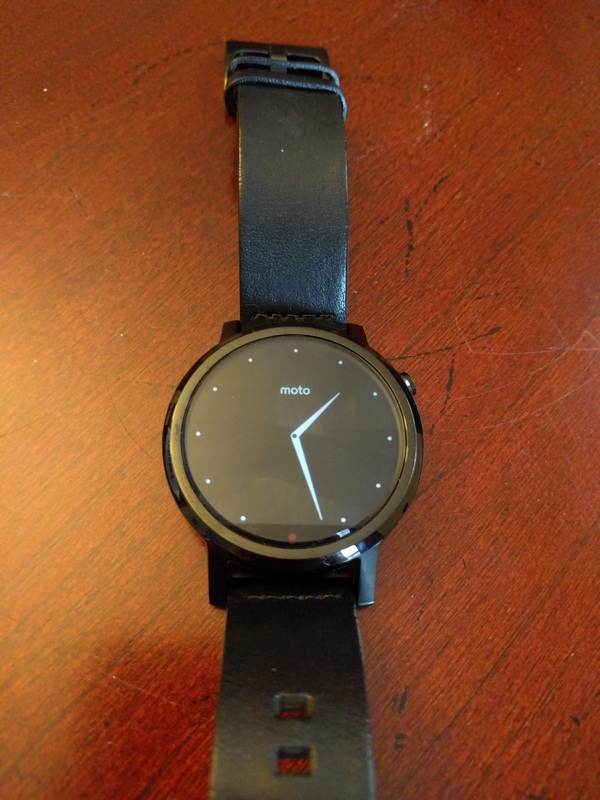 Once they are no longer pending, I figure the phone is a gift and I plan to see if the Moto 360 Sport will blend. The DROID is a Verizon model, if anyone knows a charity in need please contact me. In the mean time, I’m in the market for an Android Wear running watch. Based on the above experience I must unfortunately recommend avoiding all Motorola products at this time, which is a shame. The outrageously bad support is a large blemish on a company that is putting out solid quality products. I still think the Moto 360 Gen 2 is one of the best Android Wear watches currently available. In fact, I’ve purchased the device for family and friends and it’s been very well received. Quite a few people have told me they purchased one based on my review and the feedback has been positive. I like the Moto 360 Sport and some of the phones look very nice. That said, the support experience above was so terrible, the Motorola internal systems are so broken and the issues so systemic in nature that I would not feel right if one single person had to go through the above based on a recommendation I have made. So, at least for now, keep away. Far.Away. And Motorola Support, please get your act together. Note: Any text in quotes above are a direct copy/paste of the interaction. Luckily I have much of this in writing or on voice mails, but some did take place on the phone. Happy to provide supporting details if so desired. I have reached out and it appears I am not alone in this kind of experience with Motorola Support. UPDATE: They are now mysteriously able to see that the RMA “went through, and I can see the device arrived to your home”. The rep also added: “I will ask you to send us the device since with the Advance Exchange submitted a hold has been put on the card you used, if you do not send us back the device the hold will become a charge.” which is in direct opposition to the statement I have in writing from the 17th that confirms there are no holds on my card. Let it sink in for a minute that the system they use is so bad, they don’t actually know if they are billing you or not. UPDATE (August 19th): Someone from the “Executive Customer Relations” team (which based on the email address appears to be part of the office of the CEO) reached out to me. They included a tracking label to overnight the phone to them and said they would overnight me the correct watch as soon as they received the phone. So, progress. I had the phone to FedEx within an hour, and noted it would be a show of good faith for them to overnight me the watch now, since the issue has been going on for roughly three weeks already and we’re getting to the weekend. They responded, and insinuated they could do so but would not as a result of something I said in this post (the comment about the phone being a gift). My response: “Considering the show of good faith I made by having the package at Fed Ex within an hour of receiving your email AND the fact that we are on week three of this absolutely terrible customer experience AND the fact that I provided proof of shipping AND the fact that we’re on a weekend boundary that will cause another delay, I’m hoping you decide to ship something out ASAP”. I also included a photo of the Fed Ex receipt. They never responded, which is pretty disappointing and seems for lack of a better word…vindictive. I guess I’ll now be running at LinuxCon with no Moto 360 Sport. I also made it clear that this is no longer about me getting a working device. The readers, listeners and conference-goers that I have recommended Motorola products to or whom have seen me wear the device on stage and have made a purchase as a result deserve to know the systemic issues I encountered are being addressed. They completely ignored that part of my email but I will work to get it addressed. Stay tuned for further updates. UPDATE (August 20th): After posting the previous update I also sent a very frank email to the Executive Customer Relations team. They had received the phone at this point and responded saying they decided to send me a new Moto 360 Sport via Saturday deliver, which I just received. Hopefully this marks the end of my particular issue. On to the broader issue, they said “We have completed a deep dive on your case and sent off coaching and feedback to ensure this does not occur in the future”, which is encouraging. I’ve responded noting that the technical system they use should really be evaluated, as the number of cascading failures just should not be possible (remember: the system allowed for the creation of an RMA when one doesn’t exist, showed one card as declined when my credit card company confirms it was not, put two holds for different amounts on a second card but then canceled the RMA while somehow still sending out a device, which then ended up being the incorrect device. The billing issues are especially worrisome and it looks doubly bad when a tech company has this many technical failures). It is my hope based on their response that they will look into the failures and hopefully other people will not have to go through an experience similar to the one I have. As Jono and I recently received Pixel C’s, we thought that instead of doing a traditional review (the device is 6 months old, so plenty of those exist), it might be fun to do a segment where I give my quick thoughts, he gives a short rebuttal followed by discussion including the rest of the Bad Voltage team. Here’s my bit. Tune into Bad Voltage tomorrow to see hear Jono’s rebuttal and the ensuing discussion. The Pixel C is the first Android device in the Pixel lineup. The 10.2 inch tablet has an Nvidia Tegra X1 processor, 3G of RAM and either 32 or 64G of storage. It contains the sensors, cameras and other items you’d expect out of a high end tablet and is USB-C based. The device is very well constructed and with the optional keyboard weighs almost as much as Jono’s Macbook Air. As the device has been out for over 6 months, I won’t get into specs or basic usability as much as I normally do. There are plenty of existing reviews out there if you want that information (although if you’re interested in me doing a more in-depth review at another time, I’m happy to do so). I will say that the device has a really premium build quality and performs extremely well. That shouldn’t come as a huge surprise as it starts at $649 once you factor in the keyboard. On that topic, the keyboard feels better than I anticipated and while its magnetic system is a little tricky at first, it’s not nearly as bad as Bryan would have you believe. One thing many existing reviews mention is that while the hardware is fantastic, the hybrid nature of the device is really held back by Android. This review is to let you know that soon this will no longer be the case. Why? I’ve been running the Android N Developer Preview on the device for a while and the addition of Multi-window support has the potential to flat out change how useful the Pixel C is. The current split screen mode is a good start and has changed how I use the device. I think freeform mode will be the real game changer, although it looks like Google may choose to make that feature a manufacturer option, at least initially. If you have a device capable of running the Android N Beta, I recommend checking it out. So far it has been stable enough for me to use daily. The one minor change I’d make to the device is the addition of a small track pad. That aside, if you’re looking for a high end hybrid tablet, with Android N the Pixel C is definitely worth a look… especially if you can find one at a discount as it ages. While I’m both a watch aficionado and a huge tech enthusiast, I’ve not traditionally been super impressed with smart watches. Sure, I backed the original pebble but the first few generations of devices in this category just didn’t impress me. Sub par displays, laggy unintuitive interfaces and terrible battery life weren’t the only issues. They just weren’t aesthetically pleasing. Shortly before our trip to Germany for Bad Voltage Live, friend of the show Tarus Balog mentioned the translation feature on his original Moto 360. I was intrigued as I unfortunately don’t speak much German. After taking a look at the Moto 360 generation two (or 2015 version as it’s sometimes called), I saw a watch that actually appealed to me. Evidently it’s not just me, as I’ve gotten several comments on how nice the device looks from random enthusiasts since my purchase. The first thing you’ll notice when you start to build your watch using Moto Maker is that there are quite a few options. You can choose from 42mm or 46mm faces designed in men’s style, or a 42mm women’s style. There are multiple bezel choices, the case is available in a variety of colors based on which style you choose and there are myriad bands in both leather and metal. The price ranges from $299 – $449, depending on which options you choose, but given the large number of variables there should be something for everyone. Moving on to specs, all models have gorilla glass, wireless charging, an ambient light sensor, heart rate sensor, Gyroscope, Accelerometer, are IP67* dust and water resistant, and have both wifi and bluetooth connectivity. The smaller style has a 300mAH battery that should last a little over one day, while the 46mm style has a 400mAH battery that should last almost two. In my experience, that estimate is pretty accurate but does depend on whether you utilize ambient mode. The wireless charger is a little stand that turns the watch into a small clock while charging, which is a nice touch. The watch does work with both Android and iOS. It appears Motorola plans to be a good Android citizen on the upgrade side, as I literally got the Marshmallow upgrade notification as I was writing this review. With specs out of the way, let’s move on to using and wearing the watch. I’ve already mentioned that I like the look of the watch, but I should mention that it’s also well built and comfortable to wear. Getting notifications on your wrist does come in handy at times, and not having to reach for your phone to check your calendar is nice. You can dictate text messages using the watch, but I just don’t *ever* see myself doing that. To be fair, I don’t do that with my phone either. The Google Now card implementation is both intuitive and useful. The translation feature that led me to first look into buying the watch works as advertised and came in handy on multiple occasions. 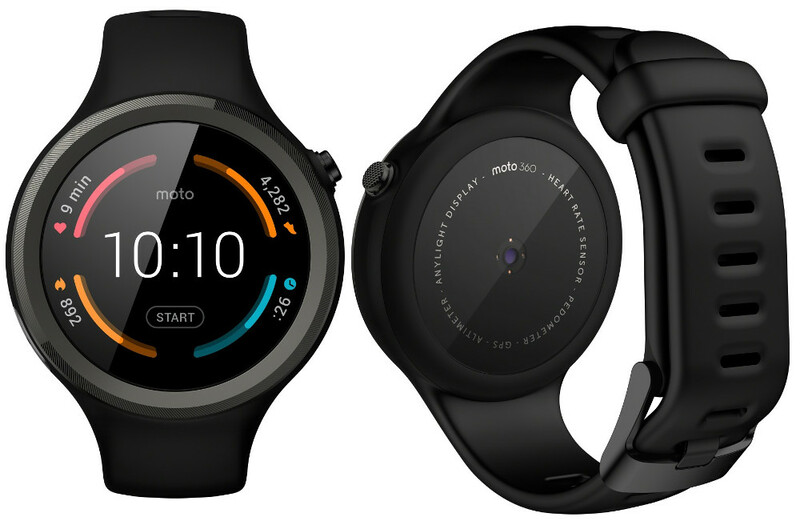 The Google Fit and Moto Body functionality is also there for those who are interested, although keep in mind Motorola has a dedicated Sport Watch. Overall I like the device more than I anticipated, but there are some downsides. I’ve only been using the marshmallow version of Wear for 15 minutes or so, but overall Wear is not quite where it needs to be. It is getting closer though, and that isn’t specific to the Moto 360. While battery life on the device is acceptable, I think for a watch to get mainstream adoption it will need to be able to last for “a weekend” and so far I’m not aware of a non e-ink one that does. I should note that while the original 360 was the first round smartwatch, both it and the generation 2 model have a small notch out of the bottom part of the display that has derisively been nicknamed the flat tire. While it doesn’t bother me much, it seems to drive some people absolutely bonkers. Competing round watches from LG, Samsung, Huawei and others do not have the tire. So, what’s the Bad Voltage verdict? The Moto 360 generation 2 is a sleek, well built, reasonably priced device with enough customization options to appeal to traditional watch enthusiasts. If you’ve been holding out on getting a smartwatch, it may well be time to take another look. Note, I’ve heard good things about the latest Huawei Watch but don’t currently have one. 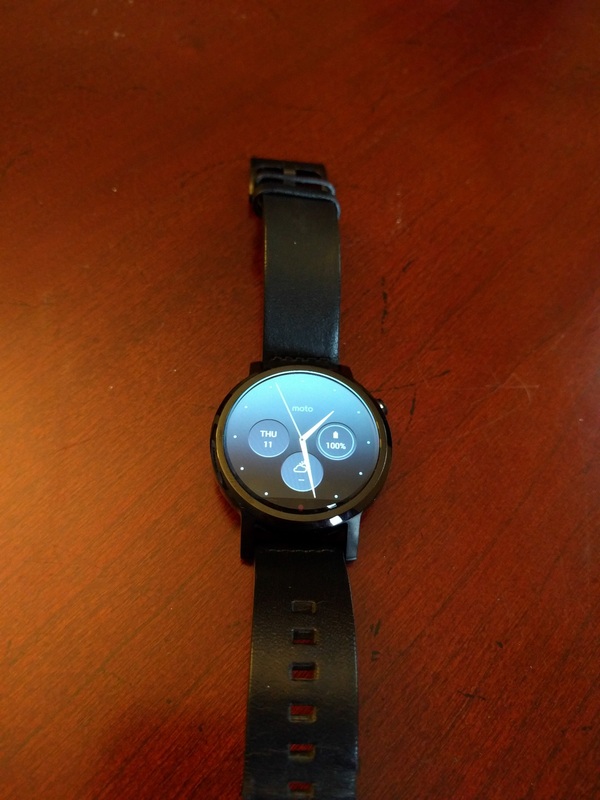 If I get one, I’ll certainly review it here as well as post a comparison to the Moto 360 2. If you think there’s another watch I should be looking at, let me know. IP67 – Withstands immersion in up to 3 feet of fresh water for up to 30 minutes. Not designed to work while submerged underwater. Do not use while swimming, or subject it to pressurized streams of water. Avoid exposure of leather band to water. Not dust proof. Here’s my review from the latest episode of Bad Voltage. Note that a slightly longer version, with some pictures and a quote is available at LQ. It’s no secret that I’m a fan of Android. As a result, I use and test a lot of different Android phones. I plan to start actually reviewing more of them. First up is the HTC One M9. You may remember that I mentioned the One M8 when I reviewed the Nexus 5. HTC’s 2015 top-of-the-line phone builds on the same sleek design as last year’s M8, sticking to the luxurious all-metal case and 5 inch Super LCD3 1080p HD screen while incorporating some key spec improvements, such as an upgraded Octo-core Snapdragon 810 processor, a 20 mega-pixel camera and a 2840 mAh battery. While it’s a bit heavy at 157g, especially compared to the iPhone 6 or Galaxy S6, I prefer the weight and balance HTC has created. At 5.69 by 2.74 inches, it’s about as large as I prefer a phone to be (For comparison, the iPhone 6+ is 6.22 x 3.06 and the Nexus 6 is 6.27 x 3.27) The M9 is one of the few flagship phones to still feature expandable storage via SD card, and it offers a unique Uh Oh one-year replacement program in the US. While the phone ships with Android 5.0, I’d expect a 5.1 roll-out in the next month or so. The device is priced at $649 unlocked in the US, with on-contract pricing starting at $199. With the specs out of the way, let’s get to what’s important; how does the One M9 perform on a day to day basis. Let’s start with the first thing you’ll notice if you’re coming from a non-HTC phone, which is Sense 7. Sense is the UI skin that HTC puts on their Android phones. If you’re a Samsung user, it’s the equivalent to TouchWiz. My last couple full time phones have been from the Nexus family and I tend to prefer the stock Android experience. That said, Sense 7 is actually quite nice. It’s clean, performs well and has a few little touches that would be welcome additions to Android proper. An interesting new feature is a home-screen widget which dynamically changes which apps are displayed within it, depending on your location. (Work, Home, on the go). The theme generator is also pretty cool: you can take a snap of anything and the phone will analyze the image and create a full palette of colors to use with icons and app headers. Even the font and icon shapes will be altered to match the overall feel of the new theme. While the screen doesn’t have the density or resolution of the Galaxy S6 or LG G4, its 441 pixel per inch screen looks better than the similarly spec’d Nexus 5. HTC has once again eschewed playing the number game here and opted for a non-2k experience which offers almost no discernible benefits to me at this screen size while eating up more of your limited battery. While the speakers haven’t changed much since the previous version, they are still far and away the best available in any phone. The camera is one area that has had a big change since the previous model. The 4-mega-pixel Ultrapixel sensor has been moved to the front of the phone and the aforementioned 20-mega-pixel camera now sits on the back. The phone produced quality photos in my tests, although low light scenarios are a bit of a weak point. I did notice some shutter lag at times, but there are similar lags on my Nexus 5. While the battery is slightly more capacious than the previous One and HTC estimates you should get a full day of use out of the phone, I’d say that’s ambitious. To be fair, most Android flagship phones seem to be roughly equivalent in this regard and it’s really an area manufacturers need to focus on in my opinion. One other thing that’s changed, and this time not for the better in my opinion, is the power button transferring to the right-hand side of the phone. This may be a more natural place for it to be positioned and some people seem to prefer it, but the fact that it’s the same size and shape as the volume buttons above it results in me inadvertently hitting the incorrect button at times. It’s placement has also resulted in me accidentally powering the screen off. Perhaps I hold my phone in a different position than most people, but I suspect it’s something I’d get used to over time. One frustrating thing about the phone is that, while it supports QuickCharge 2.0, which can charge the phone 60% in just 30 minutes, the charger that ships with the phone is not QuickCharge enabled. That seems ludicrous for a phone in this price range. It should also be noted that during serious use, the phone tends to get a bit hotter than other phones I’ve used. So, what’s the Bad Voltage verdict? The One M8 was one of my favorite phones last year. The slick design of the M9 is still amazing, but I will say the competition has upped its game considerably. While the M8 had the plasticky S5 and the small iPhone to contend with, the M9 has to compete with the also well designed S6 and the newer updated iPhone 6. A flagship phone has to score well in a lot of areas for me to consider it a phone worth recommending. It has to have solid performance, gorgeous design, a camera that will capture memories accurately and expediently, last through a full day of use and be reasonably priced. That’s a tall order to be sure. I think the HTC One M9 makes the short list (along with the Samsung Galaxy S6 and if you don’t mind a giant phone, the Nexus 6 or LG G4). If you’re looking for an Android phone I’d recommend you look at those phones and pick the one that suits your personal tastes best. As the Nexus 6 is too big for me, my personal choice would currently be the One M9. As a testament to just how good the phone is, I lent my review device to an iPhone user so they could get a feel for Android. They’re no longer an iPhone user. With the recent news that Google will not patch the WebView vulnerability in versions of Android <= 4.3, I thought it would be a good time to look at the Android version stats for LQ Mobile. You can see stats from seven months ago here. Also, a reminder that AndroidQuestions.org is now a part of The Questions Network. Now that the native LQ android app is in the 5-10,000 download range, I thought I’d post an update to this previous post on the topic of Android version and device stats. See this post if you’re interested in browser and OS stats for the main LQ site. So, how has Android fragmentation changed since my original post in February of 2012? At first blush it may appear that it’s actually more fragmented from a device version perspective. Previously, the top two versions accounted for over 70% of all installs, while now that number is just 50%. That’s misleading though, as almost 90% of all installs are now on a 4.x variant. This clustering around a much more polished version of Android, along with the fact that Google has broken so much functionality out into Google Play Services, means that from a developers perspective things are significantly better than they were during the time-frame of my previous post. I will admit I’m surprised by the age of the top devices, but they may be specific to the LQ crowd (and it’s no surprise to me to see the Nexus 5 as the second most popular phone). In this episode I’m going to review the recently released Nexus 5 phone, manufactured by LG. While the 5 in the product name is a reference to the device’s nearly 5 inch screen, it’s also the 5th iteration of the Google Nexus line (the predecessors being the HTC Nexus One, Samsung Nexus S, Samsung Galaxy Nexus and the LG Nexus 4). The exterior of the Nexus 5 is made from a polycarbonate shell, unlike the Nexus 4, which used a glass-based construction. At 5.42 inches tall and 2.7 inches wide, it’s a big phone but is shaped to feel smaller than it looks. It’s surprisingly light for its size, at only 4.6oz, and is 8.6 millimeters thick. The phone feels a bit more solid than a Samsung Galaxy S4, but sitting next to an HTC One it looks a bit, well, plain. But being flashy or ostentatious was never Google’s goal with the Nexus line. It was to showcase the unbridled, unadulterated and bloatware free vanilla Google Android experience. And the phone’s 445 pixel per inch, 4.95-inch, 1080p IPS screen helps a great deal in doing that. At the time of this review the Nexus 5 was the only phone officially running Android’s latest version: Kit Kat. And that’s a big part of the Nexus experience and something no other phone is going to offer. Manufacturers often take many months to port new versions of Android to existing handsets and in some cases ports you think will come never do. Even the new Google Play edition of phones will likely never receive updates as quickly as the Nexus line. If that’s important to you, most of this review probably doesn’t matter. Get yourself a Nexus 5. It’s hands down the best Nexus phone to date. On that note, Kit Kat is the best Android version to date as well, and is a fairly significant change from previous versions of the software. It’s sleeker, cleaner, more refined and more modern looking while being considerably more responsive. Google Search and Google Now are integrated much more seamlessly than in previous versions. And while I’m not personally a fan of Hangouts replacing SMS and MMS, one nice thing about Android is that you can easily change that. Now, back to the phone itself. Some good: The quad-core Snapdragon 800 processor with 2G of RAM means that the phone is astonishingly fast. By far the fastest phone I’ve used to date. The display is absolutely gorgeous. The battery life has also been better than most Android phones I’ve used. The overall build quality of the phone is high and the form factor is extremely usable. The Nexus experience is also difficult to beat. Some bad: While battery life has been better, it’s still fairly unpredictable at times. The camera is probably the weakest part of the phone and is considerably worse than other flagship offerings. That said, Google claims that much of the issue is software related so we may see some marked improvement here. The speaker, while fairly loud, is also frustratingly distorted at times. While I like the overall form factor of the phone, it is quizzical that they chose to give it such a large bottom bezel, especially considering the phone has only software buttons. The lack of an SD card slot is also disappointing. So, what’s the Verdict? If you want the Nexus experience or would like to buy an off contract phone, at $349 for the 16GB model and $399 for the 32GB model I think the Nexus 5 is going to be impossible to beat. I’m certainly extremely happy with the device myself. That said if you’re in a position where you have to buy a phone on contract, the HTC One (which I’ve seen as low as $75 with a 2 year contract) or possibly the Samsung Galaxy S4 are probably better options.